"Taleqani" redirects here. For the places in Iran, see Taleqan. Mahmoud Taleghani (Persian: محمود طالقانی‎, pronunciation (help·info); 5 March 1911 – 9 September 1979) was an Iranian theologian, Muslim reformer, democracy advocate and a senior Shi'a cleric of Iran. Taleghani was a contemporary of the Iranian Revolutionary leader Ayatollah Ruhollah Khomeini and a leader in his own right of the movement against Shah Mohammad Reza Pahlavi. A founding member of the Freedom Movement of Iran, he has been described as a representative of the tendency of many "Shia clerics to blend Shia with Marxist ideals in order to compete with leftist movements for youthful supporters" during the 1960s and 1970s. His "greatest influence" has been said to have been in "his teaching of Quranic exegesis," as many later revolutionaries were his students. He was notably Tehran's first Friday Prayer Imam after the Iranian Revolution. Taleghani was born to a religious family in the village of Galird of Taleqan County in Alborz Province on 5 March 1911. His father Abu'l-Hasan Taleghani, who had published a magazine called Balagh in the context of the Kashf-e hijab protests at the time of Reza Shah, taught him Islamic sciences. Taleghani continued his studies in Qom, studying the same subject at the Razaviya and Feyziyeh schools. He obtained his Ijtihad Certification from his teachers, Abu l-Hasan al-Isfahani and Abdul-Karim Ha'eri Yazdi, there. In 1938 he went to Tehran to preach and lecture on Islam and was arrested and imprisoned the next year for opposing the regime of Reza Shah. From 1948 onwards he held classes at Hedayat Mosque in Tehran. Ayatollah Taleghani had the responsibility of educating revolutionary folks from the very beginning. He traveled abroad to Jordan and Egypt in 1951 and 1952, to the Peoples Muslim Congress in Karachi, and twice to Jerusalem as the head of an Iranian delegation to the annual Islamic Congress of Quds. He supported Mohammed Mosaddeq's nationalization of the oil industry. Following the 1953 Iranian coup d'état that overthrew Mossaedegh and restored the Shah he was arrested and — according to the Islamic Republic's IRIB website — "accused of hiding Navvab Safavi, the founder and leader of the Fadayan-e Islam" Islamist assassination group. Politically active from his student days, Taleghani was a veteran in the struggle against the Pahlavi regime. He was imprisoned on several occasions over the decades, "as a young preacher, as a mid-ranking cleric, and as a senior religious leader just before the revolution," and served a total of a dozen years in prison. In his time in prison he met many leftist political prisoners and "was particularly fond of talking about his interactions with leftists." The influence of the left on his thinking was reflected in his famous book Islam and Ownership (Islam va Malekiyat) which argued in support of collective ownership "as if it were an article of faith in Islam." He helped found the National Resistance Movement in 1957 and along with Mehdi Bazargan, Yadollah Sahabi and Ali Shariati he founded the Iran Freedom Movement in May 1961. In 1971 he exiled to Zabol, a city in Sistan and Baluchestan Province and then to Baft a city of Kerman Province. Between 1964 and 1978 he spent nearly a decade in jail. Altogether he spent nearly 15 years behind bars. Finally, Taleghani after the rise of the Islamic Revolution in November 1978 was released. 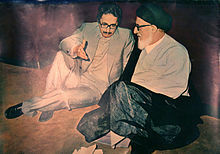 Although not as influential as Ayatollah Ruhollah Khomeini, Taleghani was instrumental in "shaping the groundswell movement" that led to the Iranian Revolution and brought Khomeini to power. During the Islamic Revolution he became chairman of the "secretive" Revolutionary Council, Iran's chief ruling body — a fact not revealed until his death. In order of Ayatollah Khomeini, he was the first Imam for Friday Prayer in Tehran after the fall of Iran's interim government, In the late July 1979. Taleghani was "known for his tolerance" and "served as Khomeini's mediator in disputes with the Kurds and other dissident groups." He also had differences with Khomeini, which led to a clash between them in April 1979. "To popular acclaim, Taleghani warned then against a 'return to despotism.'" Two of Taleghani's sons were arrested by revolutionary Guards, but thousands of his supporters marched in the streets chanting "Taleghani, you are the soul of the revolution! Down with the reactionaries! 'ì" Khomeini summoned Taleghani to Qom where he was given a severe criticism after which the press was called and told by Khomeini: "Mr. Taleghani is with us and he is sorry for what happened." Khomeini pointedly did not refer to him as Ayatollah Taleghani. Taleghani argued that the colonization as a primary reason of totalitarism and dictatorship in different countries. While not an ultimate aim per se, nationalism was seen as an instrument of anti-colonialist practices. Taleghani emphasized the resistance against Zionist regime, and travelled many times to Palestine. According to Taleghani, the redaction of Quran occurred under the caliphate of the fourth Caliph Ali. Taleghani also emphasized the continuous form of the Quran, and the strict relation between the verses of the Quran. His tafsir, or Quranic commentary, was innovative in language and clearly designed to appeal to a wide audience, with the use of narrations and juridical reports. Taleghani insisted that believers have to contemplate the meaning of the verses of the Quran. He talso sought to translate and explain the Nahj al-Balagha against the grain of contemporary social analyses and phenomena. Taleghani died on 9 September 1979. Two sons of Taleghani claimed that he was murdered but this claim was not proven. His mysterious death and lifetime achievements were the occasion of huge crowds and much emotion before and during his funeral, and was said to be "a blow to moderation and progressive thought" in the revolution. Ayatollah Ruhollah Khomeini described him "Abu Dhar al-Ghifari in the time" in the message on the occasion of his death: "He was for Islam, Abuzar of the time. His expressive tongue was as trenchant and pounding as the sword of Malik al-Ashtar." A shining ray from Quran, It was written while he was imprisoned by the Muhammad Reza Pahlavi. ^ a b Sahimi, Mohammad (30 October 2009). "The power behind the scene: Khoeiniha". PBS. Retrieved 3 August 2013. ^ Mahmoud Taleghani. Society and Economics in Islam. Mizan Press. p. 10. ^ Contemporary Islamic Economic Thought: A Selected Comparative Analysis. Alhoda UK. 1995. p. 93. ^ Afrasiabi, Bahram. Taleghani and history. Tehran: Niloofar. p. 31. ^ a b c d "Milestones, Sep. 24, 1979". 24 September 1979 – via time.com. ^ M. Stephan. Civilian Jihad: Nonviolent Struggle, Democratization, and Governance in the Middle East. p. 188. ^ Hamad Subani (2013). The secret history of Iran. Lulu.com. p. 268. ^ Ali Rahnema. An Islamic Utopian: A Political Biography of Ali Shariati. I.B.Tauris. p. 98. ^ a b c d "Demise of Ayatollah Taleghani". Islamic Revolution Document Center. Archived from the original on 13 April 2013. Retrieved 21 June 2016. ^ خوش‌منش,ابو‌الفضل (4 January 1391). "التفات به نهج البلاغه در آثار برخی از رهبران نهضت های بیداری جهان اسلام معاصر". 1 (10). ^ Mark Bowden. Guests of the Ayatollah: The Iran Hostage Crisis: The First Battle in America's War with Militant Islam. Grove/Atlantic. p. 26. This page is based on the Wikipedia article Mahmoud Taleghani; it is used under the Creative Commons Attribution-ShareAlike 3.0 Unported License (CC-BY-SA). You may redistribute it, verbatim or modified, providing that you comply with the terms of the CC-BY-SA.